A Rinkya Blog: Pocket Karaoke From Japan! 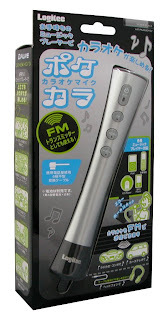 Logitech Japan has released, Pokekara, a portable karaoke mic that can be taken anywhere and plugged into most anything! If you feel the need to burst into song at anytime, Pokekara makes it easy! Karaoke is a very popular activity in Japan. It is a little different from karaoke in the US. Karaoke is a more private affair, with a group of people renting a room (private boxes) so they can sing, unlike the US, where you sing in front of everybody!